The Commission on Elections (COMELEC) has decided not to push through with mall voting on May 9. COMELEC Chairman Andres Bautista said in an interview on DZBB that the Commissioners have voted down the proposal in a 4-3 vote. 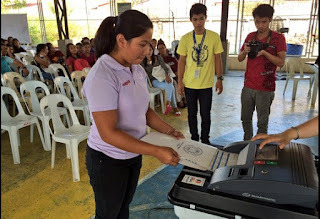 COMELEC will notify the more than 231000 voters who were supposed to vote in malls, to return to their original precincts on election day.That number includes persons with disability (PWDs) and senior citizens who expected to troop to the malls in the upcoming polls. Noting that a lot of voters will be sorely disappointed by the decision, Inquirer quotes Bautista as saying, "I really want to apologize to the voters who supported this innovation especially our senior citizens and PWDs. The mall voting would have been easier for them to exercise their right to suffrage." The only consolation is that COMELEC will still prioritize PWDs and senior citizens on election day. Chairman Bautista himself has pointed out in a Joint Congressional Oversight Committee hearing last February that PWDs and senior citizens will be provided with priority lanes for their convenience. Bautista said they will try the idea of mall voting again in 2019. COMELEC Commissioners have argued on the issue of the number of days required to transfer the precincts to the mall. Some Commissioners argued that implementing mall voting now would consitute a violation of the Omnibus Election Code which prohibits the transfer of polling precincts 45 days before the elections.